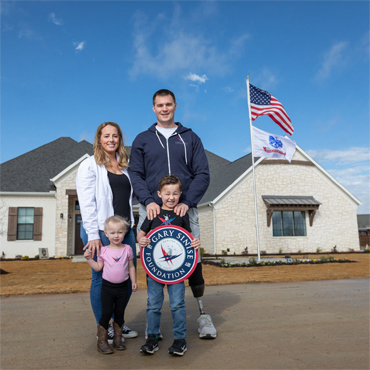 ST. LOUIS, Missouri (January 16, 2019) – The National Wood Flooring Association (NWFA) has provided flooring for its 36th home in support of the Gary Sinise Foundation R.I.S.E. program (Restoring Independence Supporting Empowerment). The R.I.S.E. program builds custom, specially adapted smart homes for severely wounded veterans and first responders. 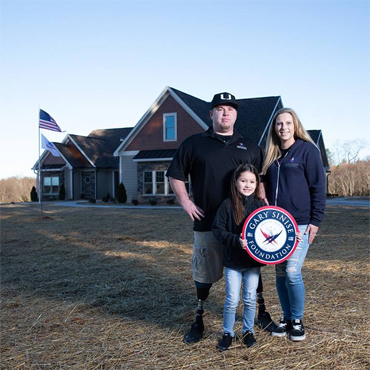 The home dedication for United States Army Specialist Tyler Jeffries took place on January 10, in Stanfield, North Carolina. Flooring for the project was donated by NWFA member Mullican Flooring. The National Wood Flooring Association is a not-for-profit trade organization, with more than 3,200 member companies world-wide, dedicated to educating consumers, architects, designers, specifiers and builders in the uses and benefits of wood flooring. The NWFA is located at 111 Chesterfield Industrial Boulevard, Chesterfield, MO 63005, and can be contacted at 800.422.4556 (USA & Canada), 636.519.9663 (local and international), or at www.nwfa.org. US Army SPC Tyler Jeffries, his wife Lauren, and daughter Ella.